Many of the pictures and images of Native Americans depict the Indians in full war paint. Many tribes of Native Americans painted their bodies and faces for rituals, dances and for battle. The designs painted were believed to hold magic powers for protection. Colors and images were also used to make the warriors, chiefs and braves to look more ferocious. Their objectives were achieved! Native American Indians even painted their horses and ponies decorating them with with war symbols or symbols of power, see Horse War Paint. Native American Indians had a highly complex warrior culture, especially those who lived on the Great Plains. Their religion was dominated by rituals and belief in a spiritual connection with nature. In their religion they blended rituals by promoting and preserving their hunting and the survival of it's people with showing respect to the spirit. Their beliefs were handed down from one generation to another. Experienced warriors were held in the highest esteem. The achievements of warriors were often reflected in the symbolic images of their war paint. The clothes, tepees and all of his belongings was decorated with the symbolism of his achievements and acts of heroism or his various spirit guides. Every mark on the face and body of an American Native Indian had meaning. The American Indian Akicita were the Warriors and Elders who had considerable powers in policing and organizing some North American tribes. The war paint and insignia of an Akicita of the Lakota Sioux had specific meanings as to their roles and responsibilities. The marshall of a war party would have war paint depicting two black stripes on the right cheek. A marshal of an Indian camp had a black stripe painted on the right cheek from the corner of the eye to the jaw line. A ceremonial marshal who organised Pow-Wows and large council meetings had a red parallel stripe. There were so many tribes of Native American Indians it is only possible to generalise the most common meanings of the colors and patterns of War Paint, Body Paint or Face Paint. White Color Symbolizes mourning. White was also the color of peace when it was used as face paint. For additional facts and info about colors see the article on Color Meanings Symbolism. The Native Indians made war paint from the natural resources that were available to them to make different colored dyes and pigments. Paint in its simplest form, consists of ground up pigment suspended in some sort of liquid, or binder such as urine, spit, egg yolks, animal fat and blood. Native American Indians first smeared their bodies with buffalo or deer fat and then rubbed on the paint. To add additional power the paint might be applied by the Medicine Man. 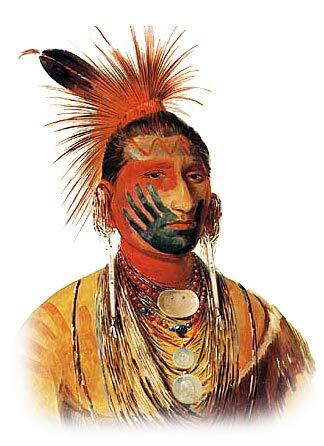 War paint was applied with the fingers, animal bones, sticks or grasses. Plains Indians used a spongy bone from the knee joint of the buffalo which held paint just as the modern fountain pen holds ink. Chiefs and elders often worn different colors to their inferiors.